Doris Attends Her Birthday Gala!!!!! Doris surprised everyone and attended her birthday party! Doesn't she look radiant! From all reports the night was a huge success. The DDAF exceeded their goal of raising $90,000. Please consider of donation in honor of Doris' 90th birthday if you can. 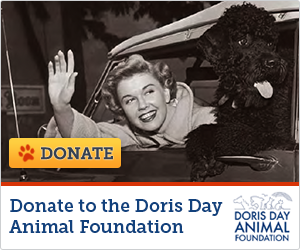 Visit the Doris Day Animal Foundation. Like I've always said, Doris is amazing and Blessed by God watching over her. She looks wonderful and I'm glad she was feeling well enough to join her fans at her 'Birthday gala'. Her health is my biggest concern. Many wishes for Doris's continued ..GOOD HEALTH. Like her song, she's BEAUTIFUL..to me!! Hugs for Doris and the pups, Stay Well. wow, after all this time......just wow. cant say any more.amazing .